Almost managed to capture the beauty of Wink of Stella! I have a little black book (for crafting!!) that I always have handy. Whenever I come across a fun fold that I like, a colour combination that I love (sometimes I cut pictures out of magazines or catalogues) or basically anything that inspires me - I write notes in my little black book. Every time I make a fun fold card or project, I write the instructions (with little diagrams) in my little black book. 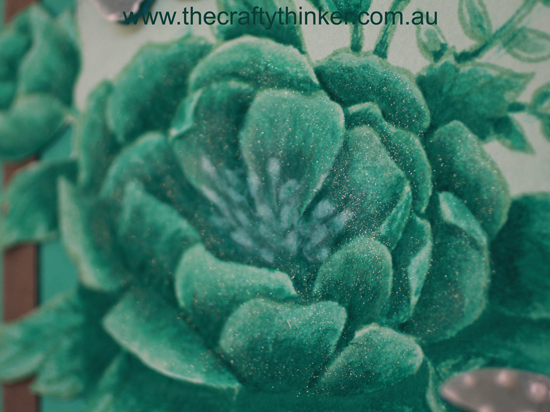 If my inspiration has come from another card-maker, I usually make a point of also jotting down their name and/or website. This is a Half Swing or Pop Out Swing card. So, I'm rather annoyed with myself that I wrote myself instructions for this half swing card (I've also seen it called a pop out swing card) but didn't include a name or website. I have spent hours trying to track it down again - to no avail. All I can do is apologise to the very clever person who created this fold and say "thank you". Once it's open, it looks quite different from different angles! 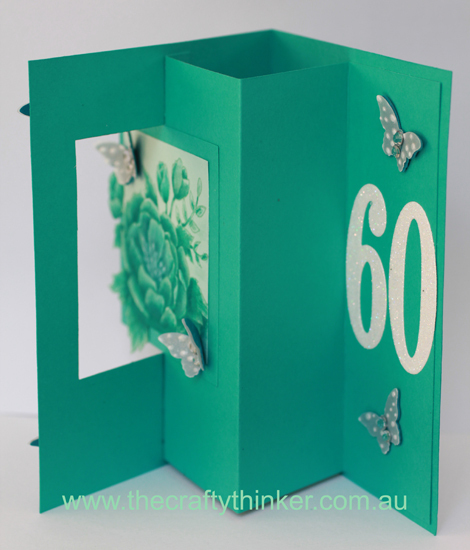 I particularly like this version of the fold because it has little tabs that hold the swing mechanism in place, so the recipient doesn't need instructions or have to hold on to anything - all they need to do is to open the card normally. How old is my Sister-in-Law is going to be? 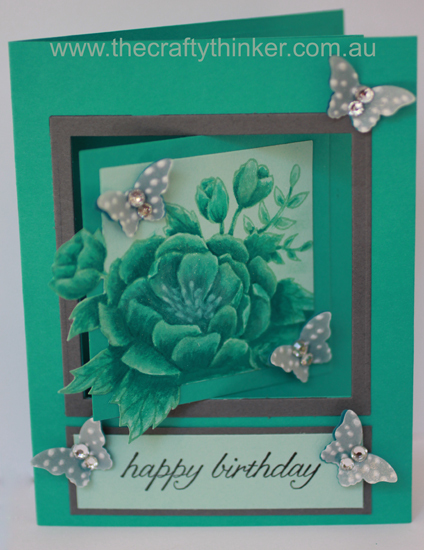 I added a Basic Gray frame to the front of the card. 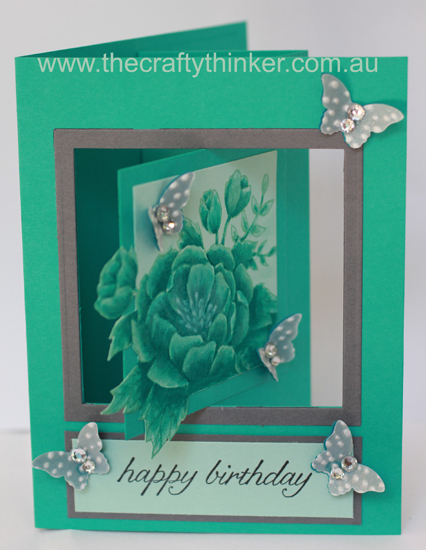 I used the Out of the Box technique to die cut the image and adhered it to the front of the card. 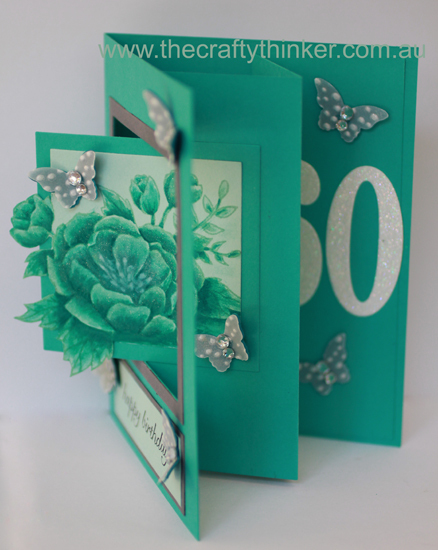 The butterflies are punched from embossed vellum and Island Indigo cardstock and have a coat of clear Wink of Stella. The greeting is from the Birthday Blossoms set. 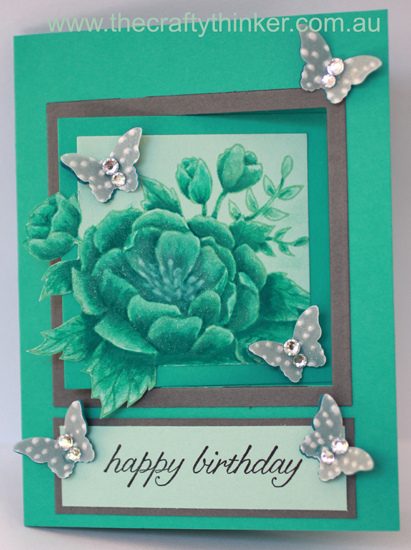 I stamped it onto Pool Party cardstock and added a layer of Basic Gray cardstock. 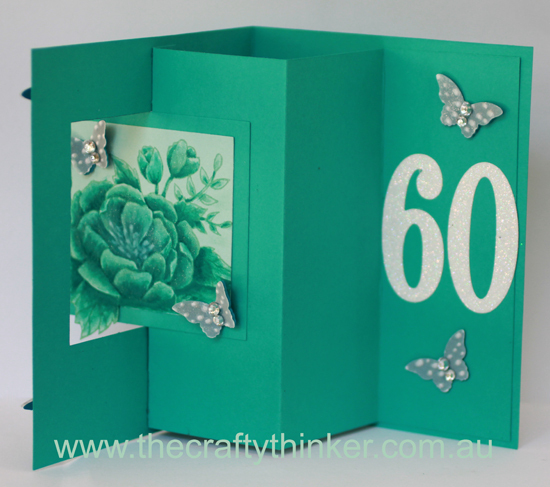 I cut the numbers with the Large Numbers framelits from Dazzling Diamonds glimmer paper. Guess the secret's out now! To visit my online store, click on one of the product images below.